More than a few of your favorite Marvel and DC Comics creators have projects that you may not have heard of, depending on how closely you follow their careers. In creator-owned comics, they get to go wild and create a story that springs entirely from their own brow, and I love seeing the results of that. Once a week on ComicsAlliance, I'm going to take a "Big Two" creator, talk about why they're good, and suggest you something original. This week, I want to talk about Garth Ennis and the importance of smooth dialogue in comics. Garth Ennis has written Punisher: Welcome Back Frank with Steve Dillon, Unknown Soldier with Killian Plunkett, Punisher MAX: Valley Forge, Valley Forge with Goran Parlov, Hitman with John McCrea, and Hellblazer with a variety of collaborators. 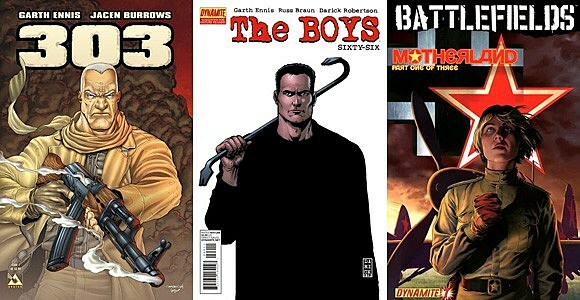 Garth Ennis has carved out a niche in mainstream comics. He doesn't do a lot of superhero work, and when he does, as in the case of the Punisher, he brings his own style to it. Ennis and Dillon recreated the Punisher for a more modern audience, and the blend of bleak situations and cruel humor definitely hit harder than any Punisher tales since the late '80s. And then, in Punisher MAX, Ennis and a solid line-up of artists recreated the character again, this time as the doomed lead in a brutal and emotionally draining war comic. Garth Ennis is good at dialogue, and therefore characterization. If dialogue is clunky and awkward, we won't believe in the characters. If it's too opaque, we won't understand the characters. If it's great... we might just learn to love the characters. And you won't find a better dialogue man in the business than Garth Ennis. He nails accents, cadences, and all styles of speech. His comics often feature conversations in bars, and that's where Ennis really shines. When this writer just lets two people bounce off each other for half a dozen pages, he's showing off. Ennis's characters are believable. They have motivations we can relate to, they speak about those motivations without spilling exposition all over the place, and there's a rhythm to Ennis's dialogue that makes it a treat to read. Ennis, a writer known for his distaste for superheroes, writes one of the most sensitive incarnations of Superman -- the ultimate superhero -- you'll ever read. The captions are Superman's thoughts, and I love the subtleties that Ennis and McCrea utilize here. 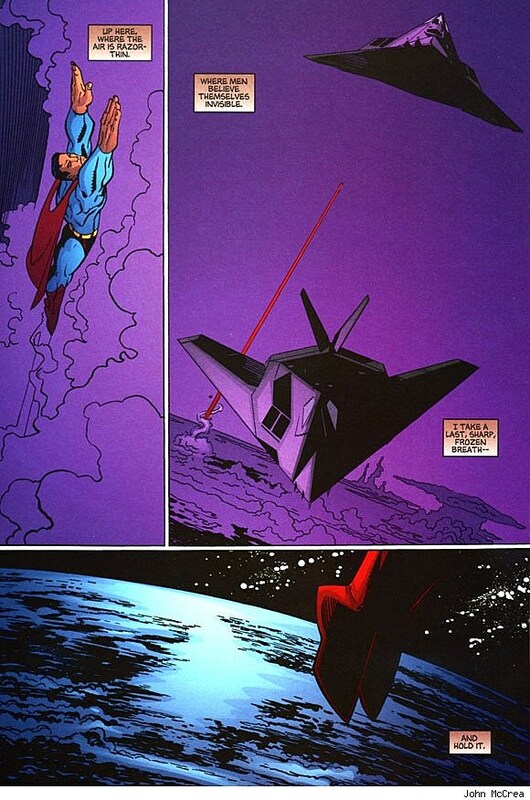 Superman refers to the upper atmosphere as a place "where men believe themselves invisible," and McCrea shows us that there are F-117 Nighthawks lurking up there. The double-meaning is plain: men who would wage war, men who think they are above everything, are not. They are being watched by someone who knows better than they do and is kinder than they are. The second page is killer, though. 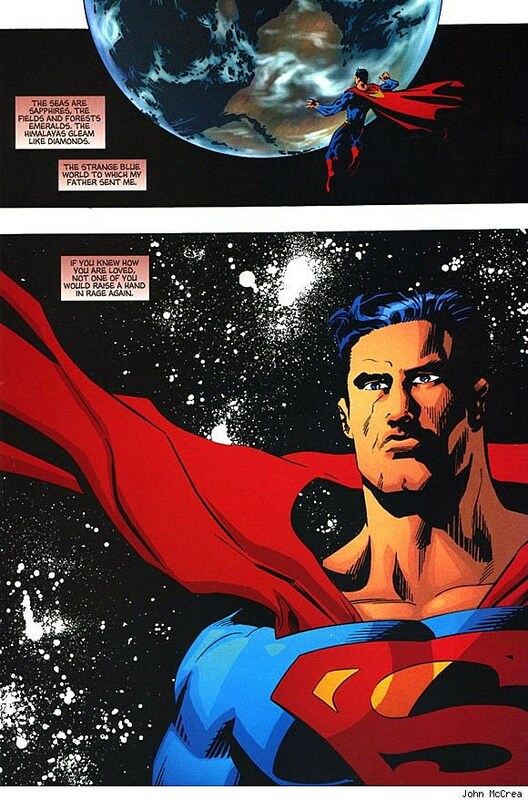 "If you knew how you are loved, not one of you would raise a hand in rage again" is the most Superman thing ever, and really illustrates the point of Superman himself: he's here to save us all, and we just need to let him. I know that ComicsAlliance's Chris Sims is adamantly against interpretations of Superman as a messiah figure, but I definitely disagree. 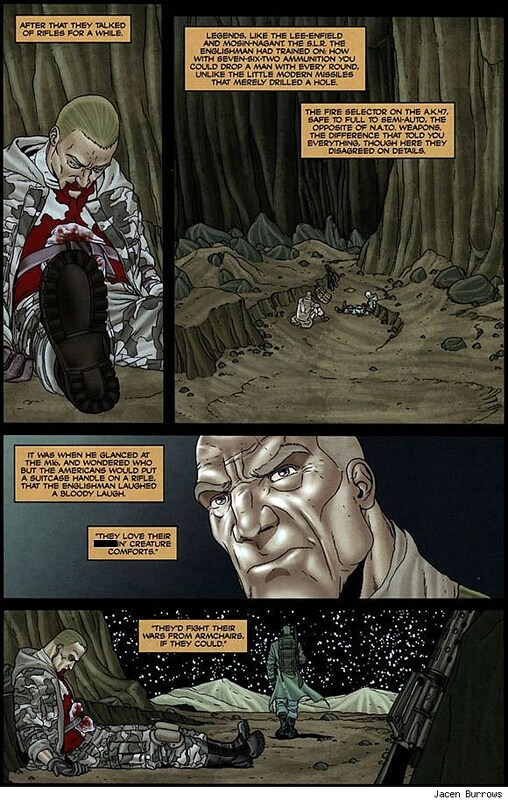 Scenes like this one are more than worth stepping into that quagmire, and I love that it was Garth Ennis, of all people, who wrote a scene as tender as this. Garth Ennis has also written Preacher with Steve Dillon, Heartland with Steve Dillon, The Boys with Darick Robertson and Russ Braun, Battlefields with a variety of artists, Crossed with Jacen Burrows, and 303 with Jacen Burrows. 303, and this scene in particular, is a marriage of my two favorite aspects of Ennis: the dialogue man and the war comics writer. It's a slow-paced story that unfolds over the course of three issues. It's about wars, warriors, and the weapons they use. But the thing that clinched my enjoyment of the comic early on was this scene from the first chapter. Two men -- one dying and one prepared to die for his cause -- sit and talk about guns. Ennis leaves a lot up to the reader here. He trusts you to fill in the blanks, but it's not hard. The point about the fire selector on the AK-47 and NATO weapons is clear as day after a modicum of thought about priorities. The Englishman and Russian's shared scorn for the M16 is another good moment, the sort of thing that builds a character up without explicitly explaining what he's all about. It's hard to find comics that are better than Ennis at his best, and if you want Ennis at his best, you need to be reading his war comics. Vertigo published a number of them under the War Stories title, and they're available in paperback. So too are Ennis' Battlefields, from Dynamite Entertainment.